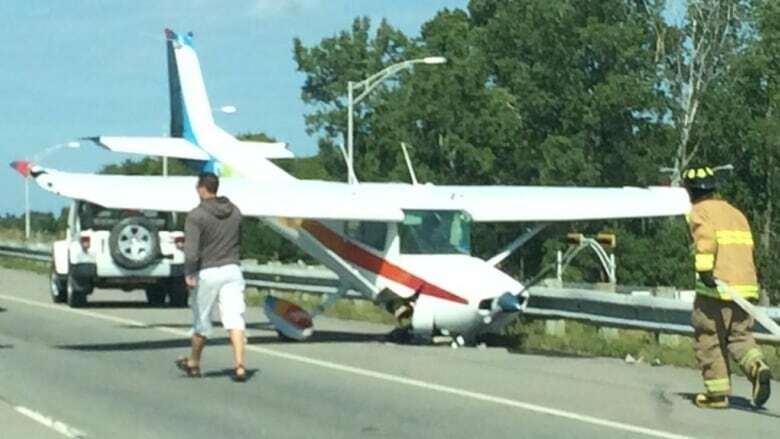 "Lucky" pilot walks away without a scratch after landing Cessna on highway in Terrebonne, Que. Police say the pilot of a small aircraft was lucky to escape without injuries after making an emergency landing on a highway in Terrebonne, Que. The Cessna plane took off from the Mascouche airport at about 10 a.m. on Friday and almost immediately had engine problems. The pilot reacted quickly, landing on the westbound side of Highway 640 near Chemin des Anglais just a few minutes after taking off. The pilot walked away without a scratch and no motorists were injured. "It's just spectacular, you know," said Sûreté du Québec Sgt. Ronald McInnis. The plane has been removed from the highway and the westbound lanes are open to traffic. Provincial police will be investigating the incident. Police said they would inspect the plane's engine as well.